I would like to maintain that I did not commit the offense as accused in regards to Wat Phra Dhammakaya. The cheques I donated to Wat Phra Dhammakaya, in the sum of 386 million baht, and to Phrarajbhavanavisudh (Ven. Dhammajayo), in the sum of 248 million baht in 2009 and 2010, to be used for the construction of religious facilities, were legally borrowed from the credit union in accordance with its regulations. Both amounts have been fully repaid to the credit union, as examined in that year’s annual audit and board of directors meeting. In addition, the cheques donated to Wat Phra Dhammakaya and Phrarajbhavanavisudh were not offered to Ven. Dhammajayo one-to-one, in private. Rather, that cheque was placed in an envelope, inside a gold bag, and offered to Ven. Dhammajayo after waiting in line alongside fellow devotees. This money offered was then collected and processed by the temple staff, without Ven. Dhammajayo’s knowledge of the donation amount. This can be verified with the attached photo. Thus, I affirm that Wat Phra Dhammakaya and Phrarajbhavanavisudh are unaffiliated with the Klongchan Credit Union Cooperative. There have been questions doubting Most Venerable Dhammajayo’s illnesses. Is he actually Ill? What exactly is he suffering from? Today, I will attempt to explain his medical conditions. I will be using information from the press release by Wat Phra Dhammakaya, medical certificates that the media publicized without permission on 20th May 2016, and my 20 years of experience as a medical doctor and vascular surgeon. 1. The Abbot has deep vein thromboses (DVT), or occlusions in the popliteal vein, deep/superficial femoral vein, common femoral vein, external/internal iliac vein, and common iliac vein. Magnetic resonance venography (MRV) reveals that the right common iliac artery is putting pressure on and occluding the common iliac vein. These findings are consistent with iliac vein compression syndrome (May-Thurner syndrome), which is the cause of DVT in this patient. MRV reveals that the left femoral vein is completely occluded. When a patient has a DVT, the venous system remodels itself to compensate by optimizing smaller, collateral veins to deliver blood back to the heart. In order to bypass the occluded femoral vein, MRV reveals the development of collateral veins from the left lateral thigh to the left hip and inferior vena cava back to the heart. 2. A secondary complication from long term DVTs is chronic venous insufficiency (CVI). CVI presents with lower extremity swelling, chronic and acute pain, skin color changes, and thickening and hardening of skin on the legs and ankles (lipodermatosclerosis). As CVI progresses, venous stasis ulcers may arise on the distal (far) end of the extremities due to lack of blood flow. The photo shows a venous stasis ulcer near the radial side(change to medial or lateral side, or if you can’t figure it out just say ankle) of the ankle caused by CVI, which is different from a diabetic induced ulcer. Diabetic ulcers are normally located on the bottom of the feet, and present with numbness and tingling of the feet (peripheral neuropathy). CVI induced venous stasis ulcers allow infection to spread more rapidly to other parts of the body and leg. If the infection is not well contained, or the leg becomes swollen enough to completely block blood flow, the tissues in the leg will necrose and die, ultimately leading to amputation. As this patient has both diabetes and CVI, venous stasis ulcers become more chronic and harder to heal. Thus any cut or wound could lead to infection and increase mortality risk. 3. The Abbot has acute collateral venous thromboses present in many locations on the lateral side of the thigh. MRV illustrates this and ultrasound shows the thrombosis in the collateral vein in the same location as in MRV. Ultrasound reveals a new occlusion due to the hypoechoic, or darkened nature, of the clot on the scan. Newly formed clots make it increasingly more difficult for blood to return to the heart, worsening edema and pain. Increase in pain, swelling, and darkening of the skin are signs of PCD (phlegmasia cerulea dolens). PCD can also lead to permanent blockage, necrosis of tissues, (venous gangrene) and possible amputation. Another fatal complication of DVTs is an acute pulmonary embolism (PE). A PE occurs when part of a clot breaks off and travels to block the blood vessels in the lungs. If the clot is small enough the effects are minute, but if the clot is large it can cause hypoxia and be fatal. Fatigue can be one presenting symptom of a PE. Luang Por Dhammajayo has a history of getting acutely fatigued due to multiple etiologies. One of these causes could be multiple small pulmonary emboli in his lungs. The press release did not reveal the results of an MRA of the pulmonary veins (which reveals PEs), thus we cannot exclude this from the Venerable’s list of medical complications. 4. The Abbot is a 72 year old elderly monk whose medical conditions include diabetes mellitus (DM), hyperlipidemia (HLD), and hypertension or high blood pressure (HTN). About a year ago, I examined a pregnant woman (24+3 weeks of gestational age) who had an acutely swollen leg for one day. The previous day she had gone to see her obstetrician. An ultrasound was performed, and her obstetrician told her she was fine. She wasn’t satisfied, so she came to me for a second opinion. I performed an ultrasound on her vascular system and found a clot in her left leg vein. The image of the clot from the ultrasound was still black (hypoechoic), indicating that it was an acute DVT, and it occluded all the way from the popliteal vein, common/superficial femoral to the common/external iliac vein of the left leg. I referred her back to the obstetrician for treatment. After the delivery, she was fine and recovered fully, but the baby happened to die from a subdural hematoma that could have been caused from anticoagulation medications to slow clotting and internal bleeding (used for DVT prevention). Both the baby and mother ran the risk of excessive bleeding from anticoagulation. From this case we are able to understand that anticoagulants do not come without risks, and some medication side effects may be fatal. No medication is without risk, and in medicine it is the physician’s job to carefully weigh the risk benefit ratio for each individual patient. This is why medicine is an art, and not a black and white science where one treatment protocol works in every case. For example, if a patient were forced to walk too soon, a clot that has not firmly attached itself to the vessel walls might break off and travel to the heart, causing a pulmonary embolism (PE), which can be lethal. However, if the patient stays non-ambulatory for a prolonged period of time, this causes muscle atrophy (weakening) and makes the patient more prone to falls and difficulty ambulating. This is why it is crucial that such a patient is monitored closely and continuously by an experienced team of medical practitioners. Writing this reminds me of when I was a resident surgeon at Ramathibodi hospital. In my last year as chief resident, a healthy-looking middle aged patient came in with a DVT in his left leg with cellulitis and infection. Almost the whole leg was dark green in color from phlegmasia cerulea dolens (PCD) causing venous gangrene, so he had to have an above the knee amputation. A few days after the amputation, he became extremely lethargic and pulmonary MRI/MRA showed multiple PEs in bilateral lung fields. He died unexpectedly 7 days later. The autopsy report found PEs in his pulmonary arteries along with an antibiotic resistant infection in his leg. The acute cause of death was from a pulmonary embolism. The first time I saw Luang Por Dhammajayo’s left leg, which was very swollen and dark red in color, it reminded me of this very patient. Luang Por Dhammajayo has a very severe condition. During my career as a vascular surgeon, I have never seen a patient with May–Thurners syndrome (complete occlusion of the iliac vein) before. May-Thurner’s syndrome is very rare and complications of DVT can be life threatening. 1. The Abbot has complete occlusion of the left common femoral vein from chronic compression by the right common iliac artery (May–Thurner syndrome), making it difficult for blood in the lower extremity to return to the heart. 2. The Abbot has severe chronic venous insufficiency (CVI) of the left leg due to May-Thurners syndrome. His leg is acutely edematous and painful, with venous stasis ulcers. The Abbot is at risk for an infection that may lead to amputation. 3. The Abbot has DVTs, or occlusions in the popliteal vein, deep/superficial femoral vein, common femoral vein, external/internal iliac vein, and common iliac vein. He is at risk for PEs and venous gangrene which also increase the possibility of amputation. 4. The Abbot has chronic medical conditions of diabetes mellitus (DM), hyperlipidemia (HLD), and hypertension or high blood pressure (HTN). He is also advanced in age, which is always a risk factor for acute and life-threatening medical complications and increased sensitivity to medication side-effects. 5. The Abbot has acute on chronic fatigue due to multiple etiologies. Multiple minor PEs cannot be ruled out in this patient. An MRI/MRA would be needed to confirm this diagnosis. It should be quite clear to everyone whether Luang Por Dhammajayo is ill or not, and what his medical problems are. Therefore it is inappropriate to accuse him of faking any condition, or to assume that his medical certificates are forged. If any governmental agency does not have confidence in my medical abilities and professional opinion, they are welcome to send their own specialists to erase any remaining doubt. The actions that have been done up to this point by the said governmental agency is considered a complete violation of the basic human rights of a patient. I REPEAT. The Abbot is HUMAN. Thus, I agree with the supporters and followers of Luang Por from all over the world who are petitioning for justice and submitting letters stating that a human rights violation has been made, including his supporters in the United States of America who are collecting names to be presented to the White House. To those who are committing this international crime of violating the human rights of a medically ill person, it's never too late to turn back. It is better to hit the reset button and do the right thing than to simply say we have passed our deadline and cannot undo anything at this time. It is inhumane to view a 72-year-old Buddhist monk who has spent his entire life doing good deeds as an enemy who is undeserving of basic human rights. Money laundering and accepting stolen property technically occurs if Ven. 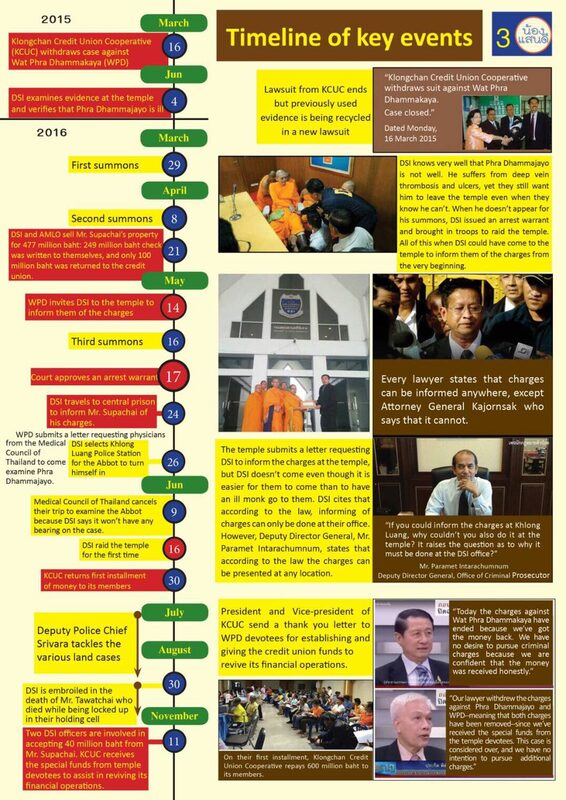 Phrathepyanmahamuni intended to collude with Mr. Supachai Srisupa-aksorn to illegally extract money from KCUC for his own benefit. However, what actually transpired does not support the premise underlying these assumptions: Ven. Phrathepyanmahamuni received the donations openly before a crowd of tens of thousands of people. He never saw the cheques. The temple’s financial department staff collected the donated cash and cheques, and deposited them into the bank, subsequently allocating them toward construction costs of religious facilities and various temple expenses as the donors had intended. This information had been previously disclosed to DSI. The assumption is that Ven. Phrathepyanmahamuni colluded with Mr. Supachai to embezzle funds from the credit union. In truth, to do so, they would have had to conceal their illegal activity. Instead, the money can be clearly traced for every transaction, starting with the credit union cheques used as a form of “payment” for donations. Cheques for large sums like these would have certainly been subject to an audit, leading to significant non-liquidity within the credit union. Any person with mal intent seeking to launder money would not have used such transparent methods. Moreover, Ven. Phrathepyanmahamuni did not withdraw a single baht of cash from his bank account. The cheques donated by Mr. Supachai Srisupa-aksorn had been transferred from Ven. Phrathepyanmahamuni’s account in their full amount to pay contractors for the construction of religious facilities, in accordance with Mr. Supachai’s wishes. They were never allocated for Ven. Phrathepyanmahamuni’s personal benefit. The transparent money trail had been verified by the Anti-Money Laundering Office and their findings were submitted to DSI. Questions have been raised as to why Ven. Phrathepyanmahamuni and Wat Phra Dhammakaya were not suspicious of the source of Mr. Supachai’s large donations. In truth, Mr. Supachai donated to other temples, schools, universities, public charities, and government sectors; moreover, his donations were not the largest in sum, compared to donations made by others to Wat Phra Dhammakaya. Mr. Supachai revealed that the funds for his donations were derived from his successful business, so Wat Phra Dhammakaya had no reasons to be suspicious and received the donations in the same manner as any donations by others. When the lawsuit was filed, Mr. Supachai released a statement indicating that he borrowed money from the credit union to make donations to Wat Phra Dhammakaya and Ven. Phrathepyanmahamuni, and already repaid the credit union in full. Once the lawsuit was filed, supporters of Ven. Phrathepyanmahamuni felt a decision left to the court would be exhaustive and credit union members would be in dire straits. They also felt that Wat Phra Dhammakaya and Ven. Phrathepyanmahamuni’s reputation would also be impacted. As a result, they raised a sum of 684.78 million baht and returned it to the credit union. This was an identical amount initially donated by Mr. Supachai to Wat Phra Dhammakaya and Ven. Phrathepyanmahamuni; both parties acknowledged this transaction in court. Afterwards, the credit union withdrew its lawsuit against Ven. Phrathepyanmahamuni and Wat Phra Dhammakaya and released a statement indicating their intention not to move forward with both the civil case and the criminal case against Ven. Phrathepyanmahamuni and Wat Phra Dhammakaya. They also issued a letter of appreciation to the supporters of Ven. Phrathepyanmahamuni who generously raised the full amount of funds to aid the credit union. Therefore, Klongchan Credit Union Cooperative didn’t suffer any hardships from Mr. Supachai Srisupa-aksorn’s monetary donations to Wat Phra Dhammakaya and Ven. Phrathepyanmahamuni. The President and Vice President of the Credit Union elected not to proceed with the lawsuit and even issued a letter of appreciation to the temple supporters. However, DSI continues to trump up charges and accusations against Ven. Phrathepyanmahamuni. What is the motive behind this? DSI issued a summons for Ven. Phrathepyanmahamuni to appear before investigators at its headquarters on 25th April 2016. At 11.00 hrs. that day, Ven. Phrathepyanmahamuni’s attorney submitted a request for postponement due to the ailments he presented, accompanied by a medical certificate. After the investigators reviewed the request, they informed the attorney at 11.30 hrs. that the postponement was approved. The appearance would be postponed for 10th May 2016. The attorney then departed the DSI HQ. However, at 13.30 hrs, investigators phoned the attorney to inform him that they rescinded the postponement and would seek an arrest warrant, on the grounds that Ven. Phrathepyanmahamuni was well enough to make the trip to DSI HQ. However, DSI did not appoint a physician from the police hospital or any other department to determine whether Ven. Phrathepyanmahamuni was truly ill or not. This begs the question: How did DSI know whether or not Ven. Phrathepyanmahamuni is ailing? DSI claims that Ven. Phratheypyanmahamuni was fully able to join the ceremony on 22nd April 2016. However, the medical certificate clearly indicates that he was suffering acutely. DSI’s claim is unsupported. This past year, Ven. Phrathepyanmahamuni has been ailing and has not stepped foot outside the temple. He has been suffering from deep vein thrombosis (DVT) in his left leg, which has swelled to twice the size of the right leg; chronic ulcers on the left leg from diabetes; and severe allergies. DSI examined his medical conditions when they met him at the temple last year in 2015, but have yet to make the visit with a physician this year. Ultimately, the courts made the decision to refuse to issue an arrest warrant on the basis that Ven. Phrathepyanmahamuni was not a flight risk. For what reason weren’t they able to meet him at the temple this time? Why did DSI alter their words? First, they allowed for a postponement, then rescinded, and then sought an arrest warrant. Why did they go back on their words? Was an arrest warrant necessary? Why such aggressiveness with a senior monk who has only done wholesome deeds throughout his life? Millions of Ven. Phrathepyanmahamuni’s supporters are utterly perplexed. 1. 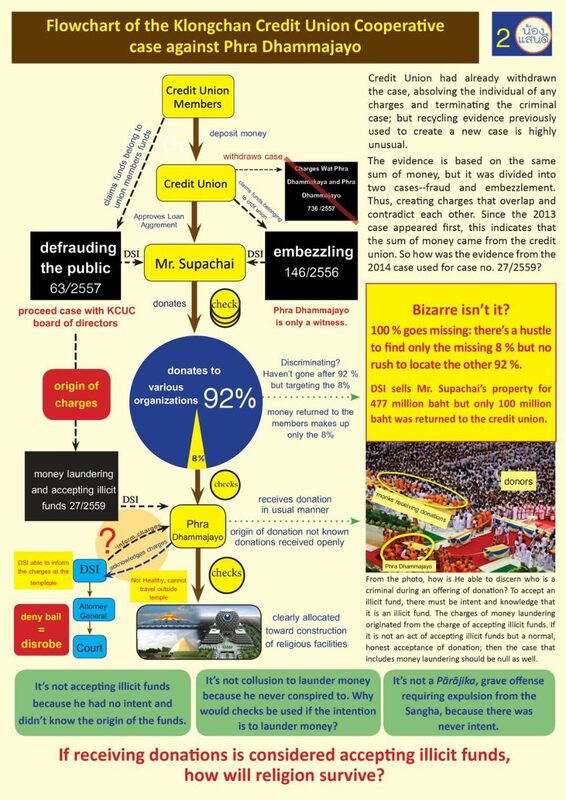 Does Wat Phra Dhammakaya have any complicity in Mr. Supachai Srisupa-aksorn’s alleged embezzlement of Klongchan Credit Union Cooperative (KCUC) funds? A: Wat Phra Dhammakaya and Ven. Phrathepyanmahamuni have zero involvement in the alleged embezzlement. After the allegations were made, the Temple asked Mr. Supachai regarding the source of the funds, and he disclosed that he had taken out a loan from KCUC and repaid it. 2. Were any suspicions raised when donations in the amount of hundreds of millions of baht were being offered? A: Mr. Supachai is not the biggest donor at Wat Phra Dhammakaya; there are other generous donors who donate greater sums. When he came to offer these large donations he indicated a few business and mining investments of his were highly profitable, thus giving the Temple no reason to be suspicious. 3. What did Ven. Phrathepyanmahamuni and Wat Phra Dhammakaya do with the donations? A: The entire donation was allocated toward the construction of religious facilities according to the donor’s wishes. Since a great number of people participate in mass meditation at Wat Phra Dhammakaya, up to a million on special events, it was necessary to have facilities that can accommodate those in attendance. 4. Why did Wat Phra Dhammakaya return the donation, in the amount of 684 million baht, to Klongchan Credit Union Cooperative? A: Wat Phra Dhammakaya received these donations with transparency and in good faith, and subsequently allocated all the funds toward the construction of religious facilities in accordance with the donors’ wishes. When the lawsuit was filed, supporters of Wat Phra Dhammakaya realized if the case were to go to court, the trial would be exhaustive, affecting the reputation of the Temple and Ven. Phrathepyanmahamuni, and bringing hardship to credit union members of the credit union. Therefore, funds to compensate the credit union members in the full amount that Mr. Supachai donated to the Temple and Ven. Phrathepyanmahamuni was established by the Temple supporters. 5. What is the Temple’s current relationship with KCUC? A: The credit union issued a letter of appreciation to the supporters of Wat Phra Dhammakaya for their compassion in raising the funds to aid the credit union and its members. The supporters did not have any legal obligations to return any of the funds since the donations were received with transparency and allocated toward religious structures as the donors had intended. Mr. Supachai had also offered donations to other temples, schools, and many other organizations; they have yet to return their donation to the credit union in any way. 6. The general public believes that donations made to temples should be more transparent and include the source of each donation. Does Wat Phra Dhammakaya agree with this view? A: Temples, organizations, or various foundations rely on donations to operate. Therefore, questioning the donors about the origin of their donations would be extremely impolite and inappropriate. In practice, this idea would be quite difficult to implement. However, the Temple agrees with having as much transparency as possible and invites every sector to propose a solution that is practical that benefits all parties involved. According to the news, Thailand's Department of Special Investigation (DSI) has summoned Venerable Phrathepyanmahamuni (Luang Por Dhammajayo) to acknowledge allegations that he has committed wrongdoings by conspiring to launder money and to receive stolen property. Wat Phra Dhammakaya affirms Ven. Phrathepyanmahamuni’s innocence and denies all such allegations. Ven. Phrathepyanmahamuni (72), Abbot of Wat Phra Dhammakaya, began studying Dharma in 1963 while he was a freshman at Kasetsart University. He practiced meditation with Khun Yai Chand Khonnokyoong, top disciple of Luangpor Sodh, the famed Abbot of Wat Paknam Bhasicharoen, without missing a day even during final exams at the university. Ven. Phrathepyanmahamuni graduated from Kasetsart in 1969 with a Bachelor’s degree in Economics. He took the saffron robe to become a Buddhist monk for life at Wat Paknam in 1969, whereupon, he was given a monastic name, “Dhammajayo". In 1970, one year after Ven. Dhammajayo’s ordination, Lady Prayad Pattayapongsavisuttatibodi donated 78 acres of land at Klong Sam Precinct, Klong Luang District, Pathumthani Province, to the group to build a Buddhist temple. Ven. Dhammajayo and his team spearheaded the development and building of the temple facilities, which were later to be known as Wat Phra Dhammakaya. The temple was formally established on Magha Puja Day, February 20, 1970. The temple continued to prosper since. On important Buddhist days tens of thousands of people came to practice meditation at the temple. The land eventually became too small to accommodate the ever-increasing number of laypeople who came to use the facilities. Through the years that followed, temple congregations contributed funds to acquire more land, now grown to 1,000 acres. Anyone can say anything, good and bad. What is more reliable than words is action—more than fifty years of continuous action. Building religious facilities capable of accommodating one million Buddhists. This is an exceptional job that requires a lifelong dedication. The cetiyas, the chapel, the meditation halls and numerous other facilities, the combined values of which amount to billions of Baht, belong to the nation and the religion. Not one single Baht has been subsidized by the government. Producing more than 4,000 monks, novices and temple staff and helpers who dedicate their lives to Buddhism, as well as a million laypeople who have found refuge in Buddhism. The Buddha said, “Morality can be recognized when people live together.” Those who have lived together for tens of years obviously must have known the character of the people they have lived with. If Ven. Phrathepyanmahamuni is not truly virtuous, would you expect any of the monks, novices, temple staff and helpers, to have dedicated their lives to the religion under his leadership like they have done? It is only natural that one has to realize the goodness of something before one is willing to dedicate one’s life to that something. Can one accuse a person who has done goodness consistently throughout his life of pretense? Provided requisites and food for mass-ordinations of more than 10,000 monks in towns and villages throughout Thailand, twice a year, every year. This is a campaign to prevent temples from being abandoned. Provide reliefs for people in Thailand and other countries who suffered natural disasters, such as floods, hurricanes and tsunamis. Ven. Phrathepyanmahamuni has lived a life of purity from a very young age to now an advancing age. At age 72, his health is failing. This is the final stage of his life. To accuse a virtuous person such as him of money laundering and receiving stolen properties is groundless and unconscionable. Think of it logically. Why would someone like him want to do such a thing? He has done a great deal for Buddhism and the society. Klongchan Credit Union Cooperative issued an appreciation letter to supporters of Wat Phra Dhammakaya who raised funds to aid the Credit Union, issued a press statement, and made a recent appearance on a television program to publicly demonstrate their gratitude and announce they were withdrawing their case against Wat Phra Dhammakaya and Most Ven. Phrathepyanmahamuni. See the video clip, letter, and press statement below. This is in reference to lawsuit, civil case No. พ 736/2557, filed at Thanyaburi Court, by Klongchan Credit Union Cooperative (KCUC) against Mr. Supachai Srisupa-aksorn and associates for colluding to embezzle funds amounting to no less than 15 billion baht from KCUC during 2009-2010. Of this amount, 684.78 million baht was paid by checks, totaling fifteen, by Mr. Supachai to Wat Phra Dhammakaya and Prarajbhavanavisudh (Phrathepyanmahamuni or Venerable Dhammajayo). The suit demands that said funds be returned to KCUC by Mr. Supachai, Wat Phra Dhammakaya and Phrarajbhavanavisudh. An arbitration hearing is set for March 16, 2015. It is the view of the devotees of Wat Phra Dhammakaya and Phrathepyanmahamuni that the funds in question were received with complete transparency and in good faith. These funds have been used for the construction of religious facilities as specified by the donors. By law, the temple is not at liberty to utilize funds donated by other donors towards various religious purposes, to pay to the KCUC. These devotees are concerned that the lawsuit would become lengthy and cause a negative impact to all concerned. They made a collective effort to raise money to provide relief funds to help alleviate the situation. A total of 684.78 million baht was raised and given to KCUC. These funds are to be used to support the credit union’s business operations and provide financial relief for its members. The amount will be paid in six equal monthly installments of 100 million baht beginning March 16, 2015, with the last payment being 184.78 million baht. These payments are extremely helpful to the credit union and its members. We are happy that KCUC recovered the funds in full from the Dhammakaya devotees without having to pursue them in court. We express our thanks and gratitude toward the devotees of Wat Phra Dhammakaya and Phrarajbhavanavisudh for their kindness. All lawsuits, civil or criminal, against Wat Phra Dhammakaya and Phrarajbhavanavisudh are being withdrawn by us. As for those other parties which funds are yet to be recovered, the lawsuits will continue. KCUC has submitted letters to the Department of Special Investigation (DSI) and Anti-Money Laundering Office (AMLO) advising them that it is no longer interested in pursuing the case, civil or criminal, against Wat Phra Dhammakaya and Phrarajbhavanavisudh. All suits against them are to be withdrawn. As for the cases involving other parties who have not yet returned the funds to KCUC, lawsuits against them will continue. The relief funds received from the devotees of Wat Phra Dhammakaya will be used to provide liquidity for the business operations of the credit union as well as financial assistance for its members. This is in accordance with the KCUC’s business plan. We thank all media organizations and members of the media community for their understanding and cooperation.